Children facing cancer—whether their own, a family member’s, a friend’s, or even a pet’s—will find help in understanding the disease through this book. 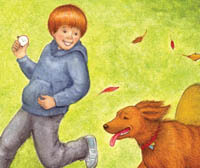 A young boy discovers his dog’s lump, which is then diagnosed with those dreaded words: “It’s cancer.” The boy becomes a loving caretaker to his dog, who undergoes the same types of treatments and many of the same reactions as a human under similar circumstances (transference). 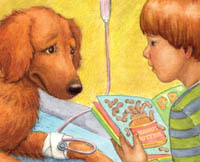 Medical writer and award-winning children’s author, Sherry North artfully weaves the serious subject into an empathetic story that even young children can understand. This fictional story includes a 4-page For Creative Minds section in the back of the book and a 25-page cross-curricular Teaching Activity Guide online. 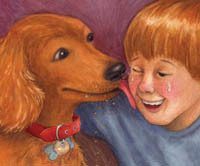 Champ’s Story is vetted by experts and designed to encourage parental engagement. Its extensive back matter helps teachers with time-saving lesson ideas, provides extensions for science, math, and social studies units, and uses inquiry-based learning to help build critical thinking skills in young readers. The Spanish translation supports ELL and dual-language programs. The interactive ebook reads aloud in both English and Spanish with word highlighting and audio speed control to promote oral language skills, fluency, pronunciation, text engagement, and reading comprehension. Vetters: Thanks to Michael W. Smith, MD, Chief Medical Editor at WebMD, for verifying the information in this book. This book is the result of a partnership between Arbordale Publishing and the ASCEND Foundation, a 501(c)(3) registered non-profit with a track record of initiatives designed to make a measureable difference in the battle against cancer, one child at a time. 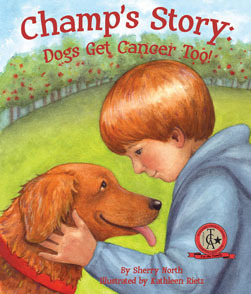 Sherry North (Champ's Story: Dogs Get Cancer, Too) is an award-winning children's author and medical journalist. A former medical producer for CNN Headline News, Sherry has written and produced a number of award-winning medical documentaries for public television, and she currently contributes to WebMD. In the children's book realm, Sherry has written Because You Are My Baby (Winner of a 2008 NAPPA Gold Award), Because I Am Your Daddy, Sailing Days, and The School that Sank. Her writing has also appeared in Highlights magazine and she was a runner-up in the 2008 Magazine Merit Awards. 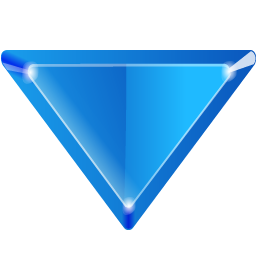 Sherry has presented at many preschools, elementary schools, and libraries. She was also a featured speaker at the 2008 Miami Book Fair International. She lives in South Florida with her husband, son, daughter, dog, and cat. For more information, visit her website at http://www.sherrynorth.com/. Sherry is also a featured blogger for the Miami Herald's parenting site.